This week I have picked up another interlibrary loan which means I currently have quite a few out - perhaps too many. It prompted me to ask do you use the interlibrary loan? We are lucky because it is a free service for us, like nearly everything at our library. The only downside to an ILL is that you can't actually renew it! Fables Volume 1 by Bill Willingham - I have been hearing great things about the Fables series of graphic novels for the longest time but my library has never had any of them. I have finally just requested it through ILL so I can see whether they live up to the high expectations I now have! Obernewtyn by Isobelle Carmody - Shannon from Giraffe Days is hosting a readalong of this series. It will also count for the Aussie Author Challenge and Once Upon a Time so I am definitely planning to read it. Not sure if I will keep up with the schedule to read the whole series before the end of the year or not but we will see! 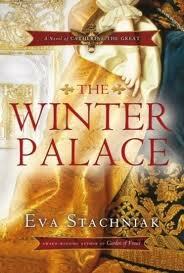 The Winter Palace by Eva Stachniak - I had this from Netgalley but didn't get to it in time. The Food of Spain by Claudia Roden - A couple of weeks ago I posted about a Spanish cookbook from an Australian chef. In the comments, someone mentioned that this book had just won a major award as the best cookbook in the world so I couldn't not request it! I guess I was outside of the target age range when it came out, and at the time it wasn't as easy to find out about the good books you were missing out on. I love the Fable series! I need to get back into reading those. I hope you like series!!! Our normal books can be renewed three times so in th eend I can have those books out for three months, but yes, ILL is not extendable. It's a very popular series of graphic novels. 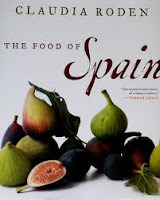 The cover of the Food of Spain is beautiful. Enjoy! It is! And the book is actually pretty big so I am looking forward to spending time looking through it. I got The Winter Palace a few weeks ago, and am excited about listening to it. Also, that Fables volume looks excellent as well. Great finds this week, Marg! 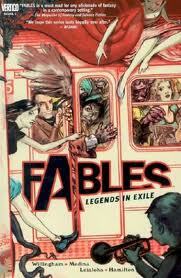 yay, Fables! A bit worrisome about the high expectations, though. That can sometimes end badly... And, interesting about the Carmody read-along. I have the first 3, I think... I am so bad with read-alongs, though. It can sometimes end badly. We will see! You are lucky - I use the ILL occasionally but we have to pay for it. Beautiful cover on the Isabelle Carmody. Enjoy your loot! I am very lucky that our library really doesn't charge us for anything other than using the computers. Ah, Fables! I enjoy them but can't say I think they're quite as wonderful as I hoped. I just looked up The Food of Spain. It's actually more expensive for the Kindle edition than the hardback! How weird is that? I have never used ILL. I didn't realize such a thing existed for many years, unfortunately. Now, I seldom go to the library because I have so many books of my own. I really ought to use it for those rare occasions when I want to read a specific title that's new, though, if only to keep from bringing more books into the house. Nancy, I think I need to review my library use because I just never get to the books i own. I too have heard of Fables but have just started buying digital copies of another in the Vertigo imprint - American Vampire with writers Scott Snyder and Stephen King. I haven't heard much about American Vampire. I finally got around to reading the first Fables book last year - it was a lot of fun. I love the cover of The Winter Palace, too! There are lots of Fables fans in the blogging world! I've never used ILL because of the fees associated with it here. I only just clued into the fact that it was offered in the city where I used to live a week or two before I moved - bad timing! I'll be really interested to see what you think of The Winter Palace as I'm looking forward to reading it myself. Enjoy your loot! We are really very lucky to have almost no fees at all! Hope you love Fables!! I'm one of those fans. I also really liked The Winter Palace, and I think you will too. Food of Spain? Sounds yummy. I knew that you were a fan of the Fables series Beth! Expect to see Food of Spain featuring in Weekend Cooking in due course! The Winter Palace sounds interesting. And The Food of Spain has a gorgeus cover!